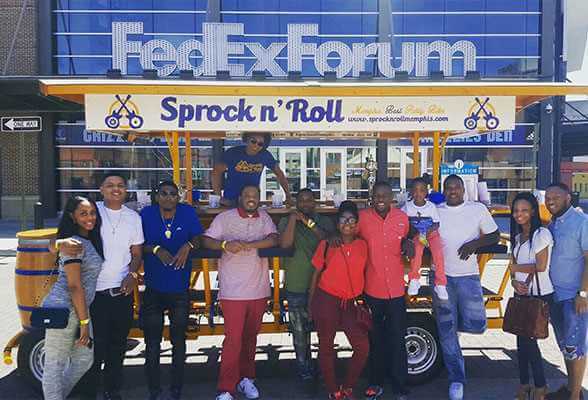 A Sprock n’ Roll party bike is a 16 seater bike that is human, party and pedal powered and is equipped with a motor assist. Other terms for these pedaling contraptions are pedal tavern, mobile bar, bar bike, beer bike, pedal pub, cycle pub, trolley pub, pub crawler, pedal wagon, etc. No matter which term you prefer, Sprock n’ Roll is your ticket to one of the best parties and celebrations you have ever experienced! 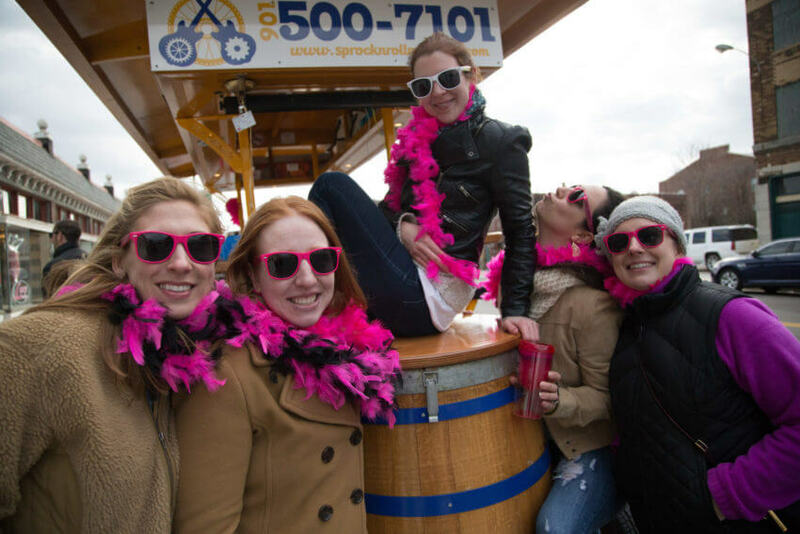 Hop on one of our bikes with your beverages (alcoholic or non-alcoholic) and take a 2-hour ride through the City of Memphis. A Sprock n’ Roll guide/driver will be your designated driver and will keep your party going. 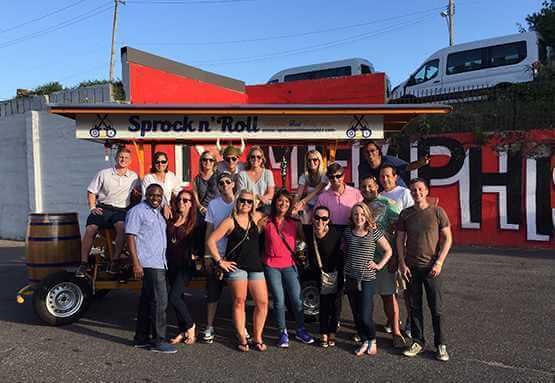 While on Sprock n’ Roll pedal taverns you will be pedaling about 50% of the time and bar hopping 50% of the time. Most groups stop at local bars 2 – 3 times. Sprock n’ Roll has partnered with the most popular bars in Midtown and Downtown, Memphis to offer you exclusive drink specials. 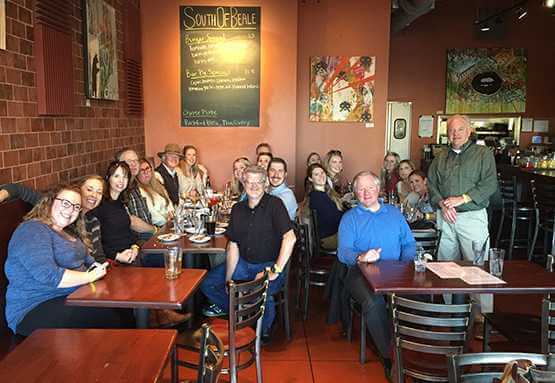 We are happy to recommend bars to your group, but unlike other tours, where we stop is up to you! Please see our individual routes to view our bar partners and specials. The bar discounts can be used during your tour and for the remainder of the day following your ride. You must be 18 to ride and 21 to consume alcohol. Sprock n’ Roll offers routes in both Midtown and Downtown. We also have four bikes at your disposal if your party is larger than 16. With the rental of two bikes, we can accommodate up to 32 people, 48 people with three bikes, 64 people with four bikes, and 80 peeps with all 5 bikes. Sprock n’ Roll beer bikes are the original party bikes that have been operating in Europe for over 17 years. 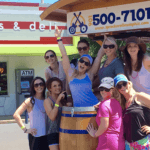 We provide a group activity similar to a party bus, but the vehicle is pedal-powered by you and all your friends. 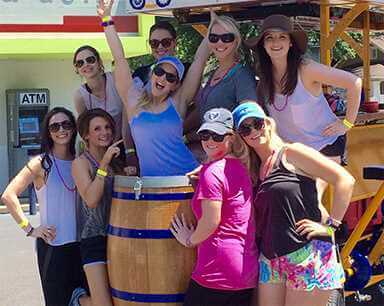 We provide a safe, fun and ridiculous way to pub crawl, celebrate a birthday, bachelor or bachelorette party, weddings, corporate entertaining, you name it! What if i don’t want to stop at the bars or i don’t drink alcohol? We will make some pit stops to give everyone a break and a chance to use the restroom. You don’t HAVE to go in the bar if you do not want to. You may stay on the bike during stops and consume the beverages you brought. THIS IS YOUR TRIP! We realize not everyone drinks alcohol, so please don’t worry if bar hopping isn’t your thang. We can accommodate you! 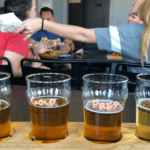 You can get non-alcoholic beverages at stops and/or we can work with you on great places to visit during your party bike ride.